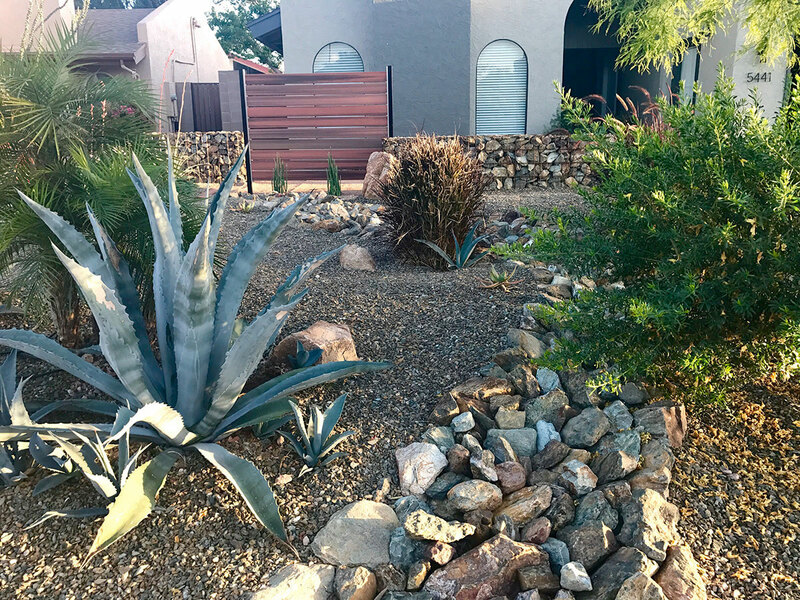 Rocks add a low-maintenance, natural touch to desert landscapes, but how do you know what size you need? It depends what you’re trying to accomplish, but in general, a mixture of sizes will make your landscape look more interesting and natural. But what size goes where? Here are some suggestions to guide you. For driveways and unpaved entryways, consider relatively small-sized gravel. At MDI Rock, we sell gravel in sizes down to ¼ inch, and you can choose a grade with a large proportion of “fines,” which are even smaller grains, so that you can walk on it comfortably. Flagstone, which can be cut in a variety of sizes, is another option for walkways. Flagstone also works well for patios. These smooth, flat stones add an elegant touch anywhere you place them. To cover large expanses, such as when rock is substituting for grass, we sometimes suggest using medium-sized rock, perhaps 1” or 2” in size. You can use even larger rocks to help with drainage and to create borders for paths or flower beds. To add drama while also creating a natural-looking landscape, go really big! Add a boulder, or a few. We sell boulders ranging from about 300 pounds up to several tons. For a natural look, bury a third of the boulder and add plants around it. Grouping a couple of different-sized boulders together can also create interest. Try river rocks, which can range in size from 3/8 inch to 5 inches, as part of a water feature or to create a dry river bed. A boulder can also add interest to a large water feature. As you can see, the size you need depends on the look you’re trying to create, but most landscaping projects benefit from strategic placement of a variety of sizes. At MDI Rock, we can help you choose the perfect product for your project. Whatever you’re trying to create, we can provide the size and color you need, whether your look requires small calico rose pebbles or giant Sedona Red boulders. We supply a wide range of products for all sorts of uses at competitive prices. In addition to our many choices in decorative groundcovers, we provide rip rap, flagstone, topsoil, sand, gravel, and a huge selection of boulders.